Independent record stores are dropping left, right and centre. For various reasons. But many stores still exist. 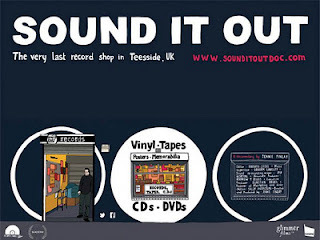 And some are even managing Local filmmaker Jeanie Finlay explores the daily goings on at Teesside's last vinyl-led record store Sound It Out, taking in a performance from Saint Saviour and Record Store Day. For the local punters of Stockon-On-Tees, Sound It Out is a cultural pillar - one of the few musically related avenues in the area. Finlay interviews both the staff at the store and the unique characters that visit, and how music brings them all together. And in the case of Becky Jones aka Saint Saviour, even brings them back to Teesside. Watch 'Sound It Out' on BBC iPlayer until 00:19, 28 Nov '12. Purchase at amazon.co.uk.